If you’re anything like me, you’ve come to New York for one thing, the food. But where do you even start on this delicious journey? There are so many options and between shopping at Herald Square, seeing a Broadway show, and paying your respects at the 9/11 memorial, you don’t have much time to scout out authentic cuisine. However, there is one cuisine, among all of the fancy tasting menus and the mouthwatering food cart halal, that you cannot leave New York without trying: New York City pizza! So below I have provided a small selection of pizza options for the different type of foodie in you just to give you a small insight into the food adventure your taste buds are about to embark upon. Before we get started on famous pizzerias, let’s take a little tour down memory lane and explore pizza’s origins. How did New York City become so well-known for its pizza? Where did it all start and Why? Well the where is simple enough, it all started in historic Little Italy. Between 1880 and 1920 more than 4 million Italian immigrants arrived to America and New York is where a lot of them decided to make their start as an American. Sometime in between 1897 and 1900 Little Italy reached its peak population at 10,000 Italian Americans living in a two square mile area. And it’s during this time, at the beginning of the twentieth century that New York got its signature dish. Combining the traditions of wood-oven bakeries with the new technology of a coal-fueled oven, the thin New York pizza with its sauce in the center and its characteristic crisp was born. Credited to creating the first pizzeria is Gennaro Lombardi and Antonio Totonno Pero, who started selling 5 cent pies out of their grocery story in 1905. And the rest is history. The trend of slices vs. whole pies took hold in the 1940s and now you can’t walk down the street without seeing someone claiming to have “the best slice in town.” Pizzarias of all different varieties are continuously popping up in this metropolis of delicious delights and even though Lombardi’s (https://firstpizza.com/) in Little Italy is still churning out delicious slices and pies on the daily, that is only the first of many places you should try on your foodie tour. 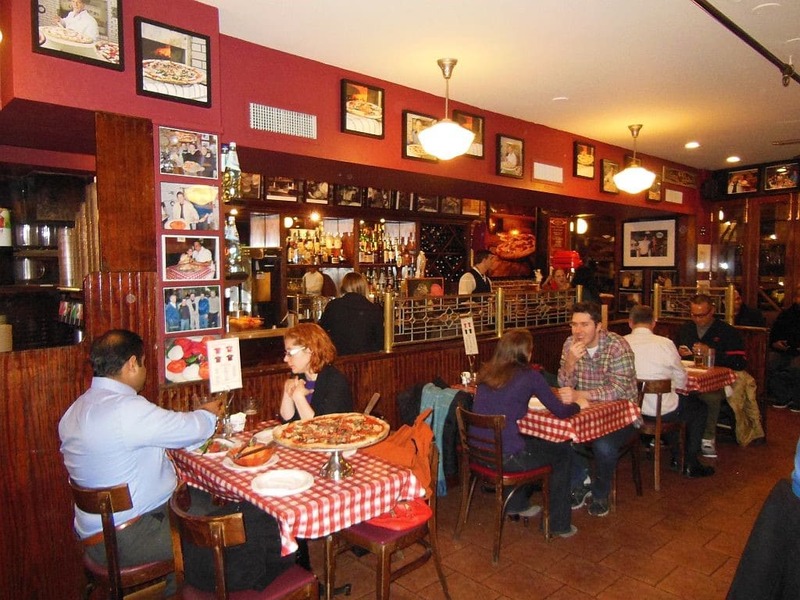 Located across the street from the Richard Rodgers Theatre on 46th, Patzeria is a Midtown hole in the wall, that is known for their simply delicious pizza and meatball subs. This is the place to go if you don’t want any frills or fuss with your pizza, just the grease and New York City tap water that is rumored to the key to New York’s pizza success. They do delivery as well, but nothing beats wandering around the Great White Way with a classic New York slice in hand. Starting around 2008, the dollar slice phenomenon is said to be a result of local businesses listening to the college students, the cab drivers, and other New York locals who needed sustenance fast and cheap. As usual, everyone claims to have been the first to create this cheap eats concept, but with a little research you can trace the trend to two different businesses: Two Bros and 99cent Fresh Pizza. These two establishments have utilized small shops with cheap rents located on busy pedestrian areas to sustain their unique business models. To learn more about the man who has taken it upon himself to rate every dollar slice in town go here: http://www.upout.com/blog/new-york-city/meet-the-man-whos-rating-every-single-dollar-slice-in-new-york-city. If you would like to know more about the history of NYC pizza or get in touch with those in the know, here are some links I used for this blog and other personal knowledge. May your food adventures be fruitful and your bellies full!